Every year, the season’s end is infused by a slew of performances rounding off the artists’ efforts from over the past months. In the choreographed folk world, where these performances are commonly named ‘annual’, folk and arts and culture outfits showcase the activities of all generational cohorts by performing traditional dance choreographies that are as a rule part of their standard repertoire. Premiering new original, artistically credible pieces is extremely rare, not only at these events but — when it comes to choreographed Serbian folk dance scene — also in general. Folk Ensemble Vila’s annual performance took place under the Iz naše i svetske kulturne riznice (National and Global Cultural Legacies) project at a crowded SPENS’s Small Hall on 1 June and deviated from this rule in many ways. Without prejudice to the fact that it completely accomplished its primary function of getting together the company’s members and friends and collectively celebrating the year’s efforts dedicated to fostering Serbia’s traditional music and dance heritage in a joyful ambiance, this performance should be seen as an extraordinary art event marked by the premiere of as many as two exceptional and entirely different but complementary original pieces authored by the ensemble’s art director, maestro Milorad Lonić. In addition to his other traditional dance renditions of which many represent world-class achievements of Serbian choreography (such as Svečanost na Oplencu. Igre iz centralne Srbije [Oplenac Celebration. Central Serbian Dances], U selo kavga golema. Igre iz Kosovskog Pomoravlja [A Big Commotion in the Village. Kosovo Pomoravlje Dances], Oj, Stojane mlad stopane. Igre iz bosilegradskog Krajišta [Oh, Stojan, Young Squire. Bosilegrad Krajište Dances], and VII rukovet), the remaining evening’s premiers included also Čučuk. Muška igra iz Skopske Crne Gore [Čučuk. Men’s Dance from Skopska Crna Gora; arrangement by Ivan Sabo) and Latice srpskog kola [Serbian Kolo Petals; arrangement by Đorđe Karaklajić]. Even though it was created at the beginning of the 1980s, which speaks to the very early expressing of maestro Lonić’s creativity, the piece titled Čučuk. Men’s Dance from Skopska Crna Gora has been hidden away from the public eye for nearly thirty years. The reasons for this are a few, but one dominant is the fact that this virtuoso, technically demanding choreography can be performed only by an exceptionally rehearsed male folk dance ensemble. The eight members Vila helmed by the inspired and courageous Srđan Petrović, along with Milorad Mirčić, demonstrated their admirable stage skills through solid movement control in group multiple spins combined with squats, quadruple spins from the squat position (Mirčić) and knee spins (Petrović). Harmonious, spirited, and disciplined at the same time, with a good sense of space in alternating circular and line formations, this masterful choreography can be interpreted as a paradigm of masculinity and masculine interpretation of the folk dance heritage from today’s Macedonia’s territory. Another notable element besides the choreography’s dance aspect are the simple but effective musical arrangements by Ivan Sabo following the traditional musical style of this region, mainly relying on a reduced selection of instruments (the double bass is joined by the tambourine, bagpipe, flute, and tapan) and then also on the linear melodic flow. 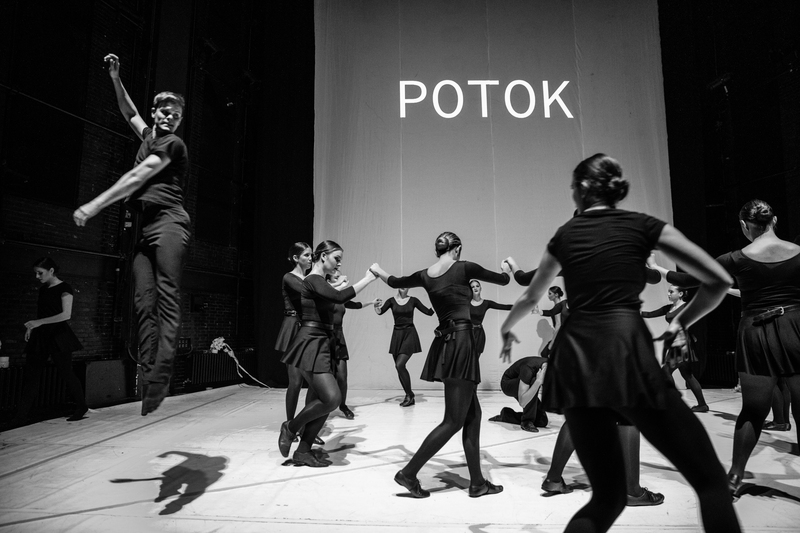 The Serbian Kolo Petals choreography, on the other hand, represents the complementary energy polarity in the current creative impulse of choreographer Milorad Lonić. Fourteen beautiful girls — demurely and with some restrain — resembling delicate petals of colourful meadow flowers, backed by the recognizable melody of Žika’s Kolo in the grand music arrangement by Đorđe Karaklajić, performed a poetic choreography based on a varied pattern of the so-called Serbian kolo’s steps (also known as the three-step kolo in ethnochoreology), which as of November 2017 is part of the world’s intangible cultural heritage. By conceiving and executing this piece, maestro Lonić and Vila dancers gave their original artistic contribution to the Serbian kolo’s entry in the UNESCO list. Significantly building on the so-far prevailing imperative of the Serbian choreographed folk dances to not change the step patterns in stage reinterpretations of individual dances and not use other parts of the body because this deviates away from the traditional dance expression, Milorad Lonić’s choreography uses the poetic potentials of the entire female body, placing the accent on hand movements and quick single and double spins while retaining the core characteristic of the Serbian folk dance performance style — skittering jumps. In line with the original idea of ​​the Serbian kolo as a lush flower, the choreography’s spatial solutions showcase a collage of dancing women’s bodies in unceasing movement, like petals tearing apart from each other and then re-joining, symbolically reinterpreting the turbulent fate of the Serbian people. As is customary, the performing ensemble was joined by other Vila groups at this event — a very good and inspired opening ensemble with especially vigorous male and vocal female performers, youth ensembles, and kids ensembles captivating with their youthful energy, a strong tambura orchestra composed of children of different generations led by Ivan Sabo and Stevan Moši, and this time the copious Narodni okrestar (National Orchestra) deftly led by Dragan Narandžić. As in previous years, Folk Ensemble Vila’s long-standing friends also performed: The Jovan Jovanović Zmaj High School graduate choir with the conductor Jovan Travica, bagpipe player Maksim Mudirnić performing a series of his own bećarac pieces dedicated to Vila and Milorad Lonić, motivated members of Kulpin’s Mitropolit Stevan Stratimirović arts and culture centre, and gusle player of potent vocal expression Petar Mišović. Amidst the diverse but to Novi Sad audience already well known repertoire with the standard number of performers, the choreography Sinu sunce na svrljiški sabor. Igre iz Svrljiške kotline (Sunshine Bathes the Svrljig Fair. Dance from the Svrljig Valley [arrangement by Dragan Narandžić]) at the evening’s end, when the stage welcomed close to sixty performers directly embodying the evening’s art director’s creative concept, which latently permeates many of his choreographic achievements — the idea of ​​fellowship and community. The number and motivation of the performers, who were creating a wonderful energy, once again demonstrated the performance potentials of Folklore Ensemble Vila. However, in the history of the Serbian choreographed folk dance, this performance will be remembered for the premier performances of two remarkable choreographic achievements that prove that stage performance of traditional dance and music can have undeniable artistic value. Yet, this requires self-sufficient artistic credibility, original creativity and courage, and then also focus and perseverance in working with the ensemble, which are most certainly qualities that maestro Milorad Lonić has.